Recently, the Maharashtra Public Service Commission has released the MPSC Superintendent Recruitment 2018-2019 Notification. Therefore, interested candidates can check and apply for the 45 Group B Vacancies (Inspector Certified School And Institutions/ Organisation and Methods Officer/ Lecturer/ District Women and Child Development Officer/ Superintendent/Statistical Officer). Therefore, in the below sections, we have bundled a lot of information regarding the details such as Application fee, Eligibility criteria, Pay Scale, Selection Procedure, Age details, Educational Qualification, Online Application link, Official MPSC Superintendent Recruitment 2018-2019 Advertisement. Moreover, we also furnish the procedure to apply for MPSC Superintendent Recruitment 2018-2019 Notification. Furthermore, the authority of MPSC stated that all the aspirants must apply through Online Mode Furthermore, all the candidates stay tuned to this article for the latest updates regarding MPSC Superintendent Recruitment 2018-2019 Notification. So, aspirants, this is the right time to apply for the MPSC Superintendent Recruitment 2018-2019 Notification. Moreover, before applying, all the candidates must verify the Official Notification carefully. Therefore coming to the official news, the officials of MPSC is already receiving the Online Application Forms. Moreover, all the aspirants keep in mind that the end of the application is 9th April 2018. So all the interested candidates verify the eligibility criteria and check the necessary details. The authority of MPSC is strictly intimating to apply before the closing date. Moreover, contenders have to apply through the Online mode. We attached the Official Link at the end of this article. Also, remember that the incomplete applications will strictly reject by the authority of MPSC. Moreover, to give the detailed information, we have shared the MPSC Superintendent Recruitment 2018-2019 Notification at the end of this article. 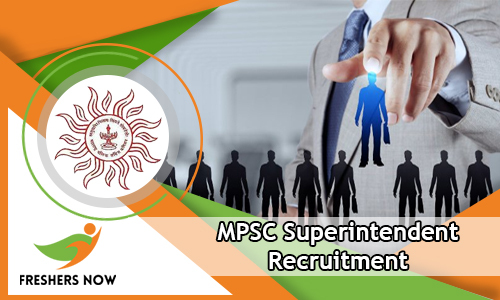 We have collected all the Precise details regarding MPSC Superintendent Recruitment 2018-2019 Notification and shared in this article. Moreover, candidates who are showing their interest in finding the necessary info can visit the current article and refer the valuable stuff. Therefore, by scrolling down this post, you can get much more critical stuff regarding 45 Group B Vacancies. So verify the given details in the table such as the name of the organization, name of the posts released by the authority, Starting and closing dates for the application, Mode of application and the official website. Therefore for more latest updates stay tuned to this current article. Moreover nowadays getting a government job is a difficult task. There is high competition for the Government exams. Many of the job seekers feel disappointed if they can’t get the proper information. So keeping this in mind we are furnishing the mandatory details in this article. Also, the authority of Maharastra Public Service Commission specified that they are looking for the eligible and talented aspirants in between the age of 38 for the General Classes and 43 for the Backward Classes. The Age Relaxation is only applicable to those candidates who got selected. So, to know about the Age Relaxation click on the official website and verify the details about Age relaxation. Moreover, the Application fee for General Category is Rs:374/-, and for the Reserved Category, the Application fee is Rs:274/-. All the aspirants should keep in mind that the fee will be accepted through the Online Payment Mode. Moreover, the selection of the candidates is purely based on the Written test and the Interview. All the aspirants should get the minimum qualifying marks in the written test. Moreover, aspirants are suggested to prepare well to qualify for the test. Contenders who will secure the Merit marks will be permitted for the next round. The authority pays an excellent scale to those who got selected in all the rounds. The pay scale for Group-B is in the range of Rs. 9,300-34,800/, Grade Pay Rs. 4,400/-. Depending upon the performance the officials will increase the salary. Moreover get the precise details in the below sections and verify the details thoroughly. Therefore to know the current status of MPSC Superintendent Recruitment 2018-2019 Notification refers the official web portal at mahampsc.mahaonline.gov.in. Moreover, the board of MPSC is strictly specified that those candidates who completed their Graduation/ Post Graduation/ equivalent courses are only eligible to apply for MPSC Superintendent Recruitment 2018-2019. The Age Relaxation will be applicable for some of the candidates. Therefore all the aspirants refer the following steps and apply for the MPSC Superintendent Recruitment 2018-2019. Moreover, there is less time for the closing date of the application. So contenders hurry up and apply for the MPSC Superintendent Recruitment 2018-2019. Moreover, we hope all the aspirants got the sufficient information regarding MPSC Superintendent Recruitment 2018-2019. If you have any query leave a message in the comment section. We will soon solve your question. Moreover to receive the notifications bookmark our website so that you can clutch the latest info. Keep browsing Freshersnow.com Regularly.